The Valley Ridge Community Association maintains and operates three recreational facilities. Built in 2016, the outdoor fitness park has multiple pieces of fitness equipment available year round. What is an outdoor fitness park, you may ask? Well, it is a collection of fitness equipment that has been designed for the outdoors, even Canadian winters, and can be used 24 hours a day, 12 months of the year and is available to you to use at no cost. The equipment is similar to equipment you would find in an indoor fitness club. Some of the equipment is designed for an upper body workout and others for lower body exercises. There are signs to educate the users on the proper way to use the equipment. 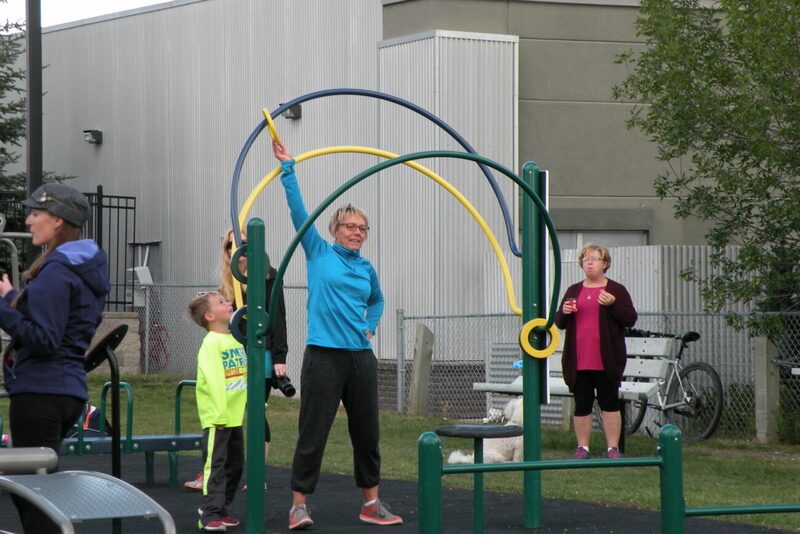 The idea came to the VRCA when some members of our community saw an outdoor fitness park in Radium, BC. Thanks to our many volunteers, the VRCA was able to complete this project in the Spring of 2016. We wish to thank our community volunteer committee members for the efforts in the design and location of the Park, The City staff who assisted with the park, the support of Councillor Ward Sutherland and MLA Deborah Drever and the volunteers who assisted at the Casino which resulted in Casino funds raised to support the building of the park. We also wish to thank Gerard Chaisson for his generous donation of a Park bench, and Shelly Fried for instructing community members on how to use the equipment. Rink Repairs currently ongoing! Please bear with us during construction. We are installing a Sport Court to enhance the usage of the rink during the summer months. Sports will include: Volleyball, Pickleball, Badminton, Basketball, and much more. In the warmer months of the year when the ice has melted, the outdoor rink is available for a variety of activities such as basketball, ball hockey, soccer, or lacrosse. For a few weeks in August each year, we have a skatepark in the rink for skateboarding, scooters, and in-line skating. Please see the skatepark page for more details. 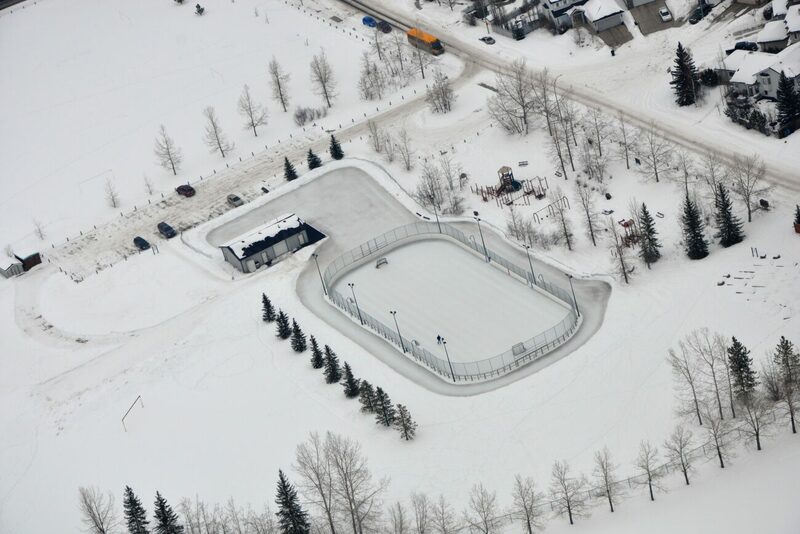 When temperatures drop below freezing, typically between November and March, we have a dedicated group of volunteers that build one of the premiere outdoor ice skating surfaces in the Calgary area. When completed, the ice surface is approximately 35,000 square feet including a hockey rink, skating oval, and a large “pond”. The skating surfaces provide enough space and variety to accommodate all levels of leisure and hockey skaters. The outdoor ice rink is a mixed-use facility. It is up to the participants to exercise caution and respect the skating guidelines and each other. The skating area outside of the hockey rink should be primarily used for family and pleasure skating. Low-key hockey play with sticks and pucks is acceptable outside of the hockey rink, but absolutely no shinny or shooting is allowed except in the hockey rink. Hockey skaters must always respect patrons who are pleasure skating; work together to get maximum enjoyment for all types and levels of skaters. Special consideration should be given to young children and novice skaters. Used primarily for shinny hockey, the rink is enclosed by boards and a fence and contains 2 NHL regulation sized hockey nets. This is the only skating surface where shooting and shinny should be executed. Please shoot and play with caution to the level of the participants. Absolutely no slap shots are permitted when young skaters are present. It is STRONGLY recommended that you wear a helmet and appropriate padding when in the hockey rink. All ages are welcome to play at any time. More advanced players should respect and include all participants no matter their skill level. The skating oval surface goes around the outside of the hockey rink. Please exercise caution as corners are blind and young children and novice skaters often use this part of the rink. Maintain a safe speed and avoid stopping and changing directions. 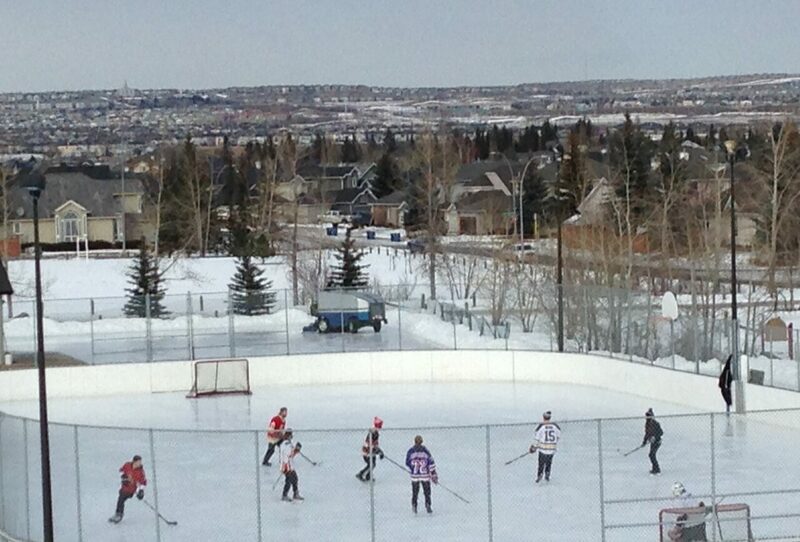 Hockey play should be limited around the oval and absolutely no shinny or shooting is allowed. If the facility is very busy, the Oval should be limited primarily to leisure skating. It is STRONGLY recommended that you wear a helmet. The skating pond is in a large “L” shape and has enough space for many skaters to enjoy a variety of skating activities within reason. No shinny hockey or shooting is allowed on the pond. Casual hockey play including passing and stick handling is acceptable within reason. If the facility is very busy, the Pond should be limited primarily to leisure skating with minimal hockey play. It is STRONGLY recommended that you wear a helmet. The rink is equipped with an automated lighting system in the evenings, and remains on until 11pm. It is not recommended to skate after 11pm and best to wait until daybreak to resume activities. If a sign is posted indicating the rink is CLOSED, or if the lights are OFF in the evening, or the main hockey rink is padlocked shut at any time, the volunteers have deemed the ice surface too warm or dangerous to skate on. Please respect these indicators and stay off the ice. If the lights are off before 11pm, they were manually switched to that mode and the rink is closed. It is NOT a mistake. No skating during Olympia (Zamboni) flooding. Shooting and shinny only in the hockey rink. Helmets and padding strongly recommended. No alcohol, smoking or chewing tobacco permitted. Lights turn off at 11pm. Our volunteer operated Olympia ice resurfacer (commonly called a Zamboni) is the primary reason for the high quality ice our volunteers are able to deliver to you each year. That being said, it is very dangerous to be skating while our volunteers are using it to clean and resurface the skating surfaces. The Olympia is large and the drivers view is obstructed much of the time preventing them from seeing skaters, especially children. This is also applicable when the Olympia is entering and exiting the garage and dumping snow. The VRCA is not responsible for injuries or death in the event you allow yourself or children to skate in front of the Olympia. It is EXTREMELY dangerous to be on the ice with the Olympia ice resurfacer! Violators will be asked to leave the ice, and the ice resurfacer will not clean the ice until all persons are clear. The facility is now under video surveillance for the sole purpose of monitoring vandalism and any other illicit behaviour. If you witness illicit behaviour, please contact the Calgary Police Service. If a significant situation occurs and/or the police are involved, please notify facilities@vrca.community so we are made aware, and we will review video recordings if applicable. Here’s your chance to become a “Zamboni” driver! It takes a tremendous amount of volunteer work to build and maintain the ice each year, so we are always looking for help to lighten the load and increase the quality of the facility. If you or someone you know would like to join our amazing team of volunteers, please complete the Outdoor Rink Volunteer Signup form.